Sheldon Bosley were delighted to once again be sponsors for the Shakespeare’s birthday celebrations in Stratford-upon-Avon over the weekend. Commemorating the 400th anniversary since the death of the world’s most famous playwright in 1616, on his 52nd birthday, the town was packed, vibrant and even more colourful than usual. 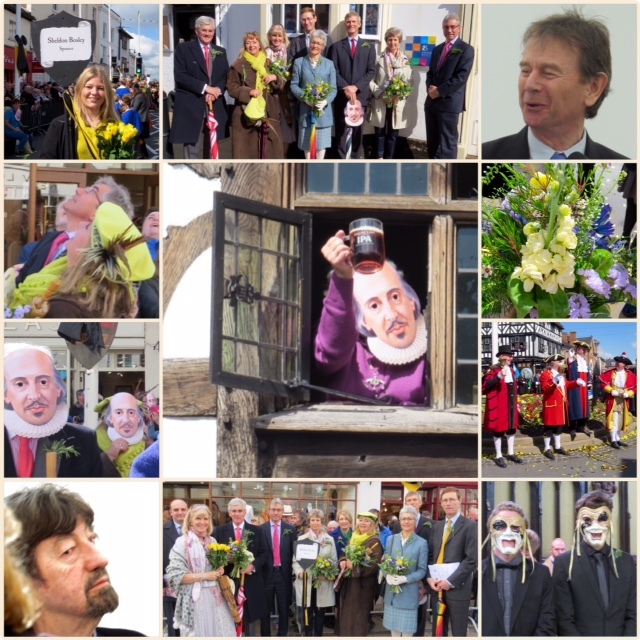 After a reception in the Town Hall partners James Walton and Sue James, plus their guests, unfurled a flag in Bridge Street and then took part in the parade through the town which included a traditional Jazz Funeral procession and live street entertainment. Having left their floral tributes at Holy Trinity Church where they would be laid on the Bard’s grave, they moved on to enjoy a splendid lunch and some excellent speeches and witnessed Sir Trevor Nunn, artistic director of the RSC for many years, receiving the coveted Shakespeare award.